The Hubble sequence six billion years ago was very different from the one astronomers see today. The two sections show how many more peculiar shaped galaxies (marked Pec) are seen among distant galaxies, as opposed to among local galaxies. The data organisation follows the Hubble tuning-fork classification scheme invented in 1926 by Edwin Hubble. The top image represents the current ï¿½ or local ï¿½ universe. 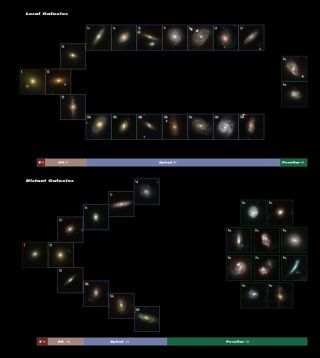 The bottom image represents the make up of the distant galaxies (six billion years ago), showing a much larger fraction of peculiar galaxies. This implies that many of the peculiar galaxies ultimately become large spirals. These images were created from data that are part of large sky surveys undertaken by the NASA/ESA Hubble Space Telescope and the 2.5 m-diameter telescope at Apache Point Observatory, New Mexico, US (Sloan Digital Sky Survey).